Tar De livsløgnen fra et gjennomsnitsmenneske, tar De lykken fra ham med det samme. Congratulations to Professor Emerita Carol Clover and Professor Emeritus John Lindow for earning The Knight’s Cross of the Order of the Falcon. Congratulations to Tiffany White for winning the Leifur Eiríksson Foundation Fellowship for American academics to do research in Iceland in the academic year 2019-20. Brava Tiffany! Congratulations to Sherilyn Hellberg for winning the American Scandinavian Foundation’s Leif and Inger Sjöberg Award for her translation of Danish author Caspar Eric’s work. 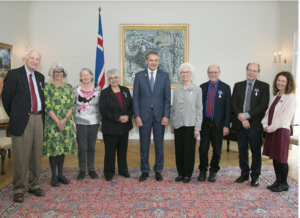 On Monday (August 13th 2018) at Bessastaðir, the Icelandic president’s residence, new members of the Order of the Falcon were honored including Professor John Lindow and Professor Carol Clover. Professor Emeritus John Lindow receives honorary doctorate. Congratulations to Ida Johnson for winning this year’s Birgit Baldwin Fellowship to support her dissertation research on “The Barn and the Beast: The Queerness of Child-Animal Figurations in Scandinavian Literature and Culture.” Impressively, Ida was also slated for (but had to defer) an award from the American Scandinavian Foundation (ASF). Hjertelig tillykke! We are happy to announce that Rosie Taylor is this year’s recipient of the Department’s Outstanding Graduate Student Instructor Award. Congratulations to Rosie. From left are Ted Andersson (Stanford), Carolyne Larrington (Oxford), Margaret Clunies Ross (Sydney), Marianne Kalinke (Illinois), Guðni Th. Jóhannesson (president of Iceland and a former professor of history), Carol Clover, John Lindow, Jürg Glauser (Zurich), and Stephanie Gropper (Tübingen). The event was part of the International Saga Conference where Professor emerita Carol Clover gave the opening plenary talk. Bravo to John and Carol! The original article, in Icelandic, is found here.